Camp Arizona: I’m talking with Rob Young today. He’s the Park Manager at Roper Lake State Park in Arizona. How’s it going, Rob? Rob Young: Good morning, fine. How are you? CA: Doing well. So, let’s start out with how long Roper Lake State Park has been there and how it got its start. Rob Young: Okay. 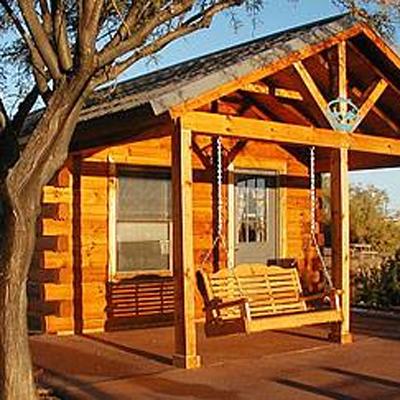 It started out as a private facility – a private recreational area. Then the Game and Fish Department of Arizona made the purchase with interest of the lake itself. And then, around 1975, State Parks and Game and Fish developed an agreement where State Parks operates the facility. 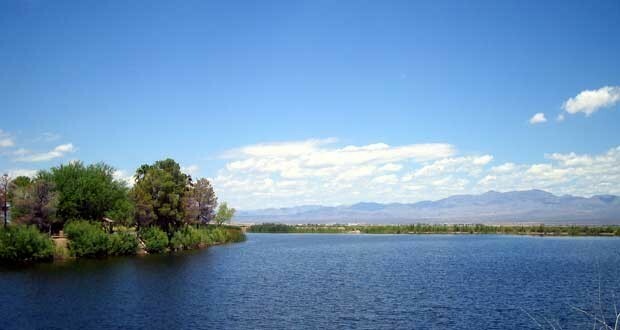 So, since then it has been operated as a Arizona State Park, offering the lake resource, which is a 30-acre lake for fishing and small boats. No gas-powered boats at this small lake. And then we have camping around the lake, and day use areas and swimming beach, and so forth. CA: Okay. What types of fish are people fishing for out there? Rob Young: Here you can fish for bass, crappie, catfish, bluegill, and then, if conditions are right, in the winter months, Game and Fish does stock with trout once the water temperature cools in the winter months. CA: Okay. And does that tend to be the most popular activity? Rob Young: You know, it depends. We kind of have a variety of clientele. Our wintertime is probably the busiest for camping. The summer is busy for day use and swimming, and fishing is kind of year round thing. CA: Okay. I see on the website here. It says natural stone hot tub. That sounds pretty interesting. Rob Young: That is. There are several hot springs all around this area that we’re located in, and within the park we do have a natural flowing hot spring. Rob Young: The temperature is about 93 degrees. CA: That sounds awesome. And what are some other attractions in the area worth checking out? If somebody was staying at Roper Lake State Park and they wanted to head out for an afternoon, what would you recommend? Rob Young: Okay. If they come in the summer months and do a little camping with us, we do have camping cabins here, and they’re popular year round. The summer, during the day, can be a little warm, but if you take about an hour’s drive from the park, you can go up to what’s called Mount Gram, and that is a four service area. So, we are sitting at about 32 hundred feet in elevation, and at the top of that mountain is ten thousand feet. So, you can change your temperatures really quick in a rather short amount of time, so that’s a popular activity. Rob Young: And then we have the River nearby, which is BLM Property, and so a lot of recreational opportunities there as well. CA: All right, two more questions for you. If you were going to spend just one hour in Roper Lake State Park, how would you spend your time? Rob Young: I would have to say sitting by the water. Whether you’re just watching the ducks, watching the fish jump, or have a fishing line in the water, seeing what your luck is going to be for that hour. CA: Okay, that sounds relaxing. And if you could spend just one night in Roper Lake State Park, which specific campsite would you choose and why? Rob Young: Some of our popular sites are the ones that’s closer to the water. And there’s various numbers that match that description there, but the water sites or sites near the water are popular for obvious reasons – being able to really do what I just described that you could do in that one hour. CA: Sure. Sure. All right, well, thanks for taking some time out of your day, Rob, to talk about Roper Lake State Park. We have some good information here to pass on to our visitors. Rob Young: Great. Thanks for the opportunity. CA: All right, take care.